The information provided by the user of Weblink.in shall be in accordance to the respective laws. The information/data provided by the user may be used by all divisions/sister concerns/ventures of the Weblink.in to carry out the purpose of the project, whereas in no case it shall be communicated/ transformed/spread to any company/third party or whatsoever for any other commercial usage without the written consent of the user. 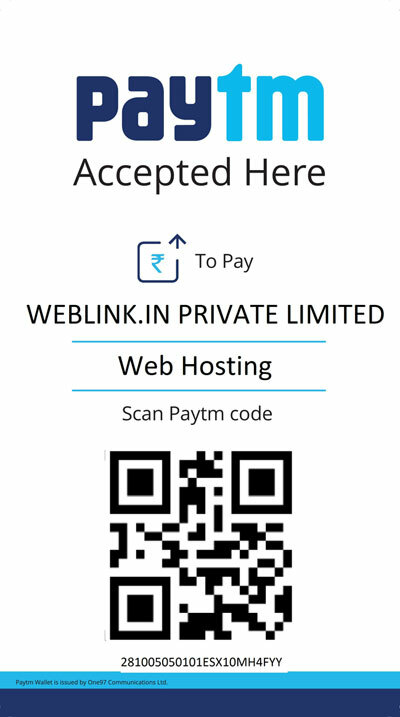 All payments for services at various portals owned and managed by Weblink .IN have to be made in favour of "Weblink .IN Pvt. Ltd." only. All payments need to be made on 100% advance basis to continue to use uninterrupted Paid Services. We have not authorized any individual or organization to collect payments in any other name (i.e. any other individual or organization name) or via personal Western Union or personal Paypal Accounts for any services rendered by Weblink .IN. You are informed that under no circumstances will Weblink .IN be liable for any damage caused due to your transactions / payments made to / in favour of such fraudulent individuals or organizations. To protect your interests, please contact us immediately if any such fraudulent individual or organization tries to mislead you. The User, who is liable to pay Subscription Fees, shall pay it on demand even if the User disputes the same for any reason. In the event that the Company deciding the dispute to be in the User's favor, the Company shall refund to the User any excess amount paid by the Member free of interest. In the event of late payment by the User of any sums due under this Agreement, the Membership and the services would stand terminated. Once subscribed, the payment made by the User for Paid service is not refundable and no claim for refund would be entertained. Weblink .IN neither offers any guarantees for the accuracy, timeliness, authenticity nor advocates any of the content posted by the other Users. All the services are on a best effort basis. The User is solely responsible for maintaining confidentiality, as well as all the activities and transmission performed through his My Folder. He/she shall be solely responsible for carrying out any online or off-line transaction involving credit cards / debit cards or such other forms of instruments or documents for making such transactions. Weblink .IN assumes no responsibility or liability for their improper use of information relating to such usage of credit cards / debit cards used by the subscriber online / off-line. As we at Weblink .IN keep up high interactions with our clients and carry out the entire process with their approval thus there is no provision for any kind of full or partial refund.